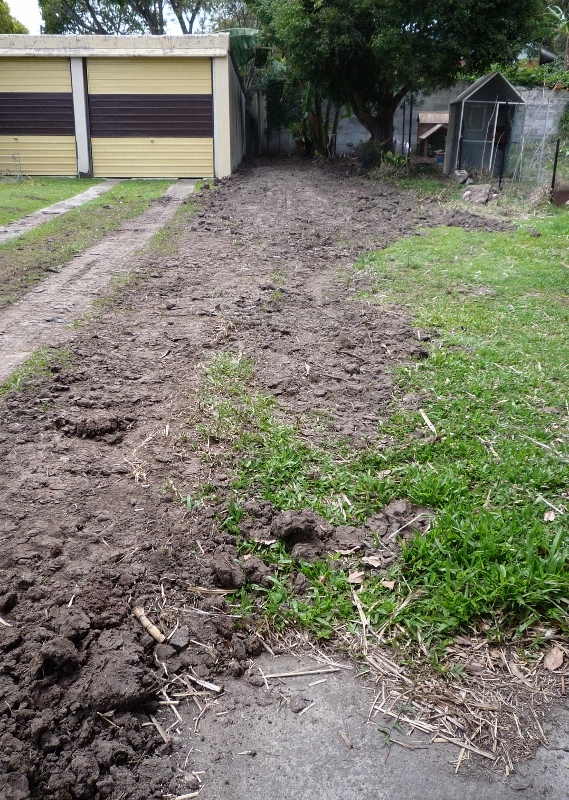 Today our 40 year old asbestos side fence was removed. 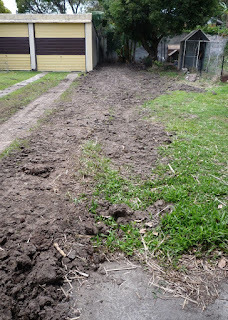 After the digger arrived unannounced yesterday afternoon our kitty was most unamused, as only cats can be, to find another cat had been rolling on the driveway. We spent a busy morning rearranging the chook fence to give the workmen some space to manoeuvre without avian interruption and then spent most of the day plugging the holes which Goldilocks the little bantam seems to have a knack for finding and squeezing through. In the end I gave up and let her have a dig around beneath the bananas. 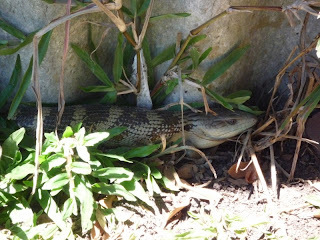 I figured it was a hot day and she wouldn't venture out into the sun to get to the vegie beds. As it turned out the chooks were not the only ones perturbed by this sudden rearrangement of fences. On one trip out to check the progress of the bantam's bipedal excavations I noticed an old friend languishing in the meagre strip of shade left by the midday sun. We hadn't bumped into one another since a check on the pineapples at the back fence several months back where she (or possibly he) was assuming much the same position. I'm not entirely sure the feeling was mutual but I was certainly quite pleased about the encounter. Not to blame her though, considering I didn't make a good first impression a few years ago when I accidentally lifted her with a shovel while moving a humongous pile of lawn clippings left by the previous owners. No injuries were sustained but it was definitely a rude introduction on my part. The fence was done in around four hours and great credit to them for being careful around the plants. I even caught the lead man trying to put my turmeric back into place with his hands after he accidentally knocked it with the digger. He also spent a good hour or so putting all the dirt back into the holes and smoothing it over.